Hitch doesn’t play well with others. Poor fella. He doesn’t know any better, just look at him, he’s like a kid who didn’t have a friend growing up. He’ll get better with classes… aw, just give him a chance! 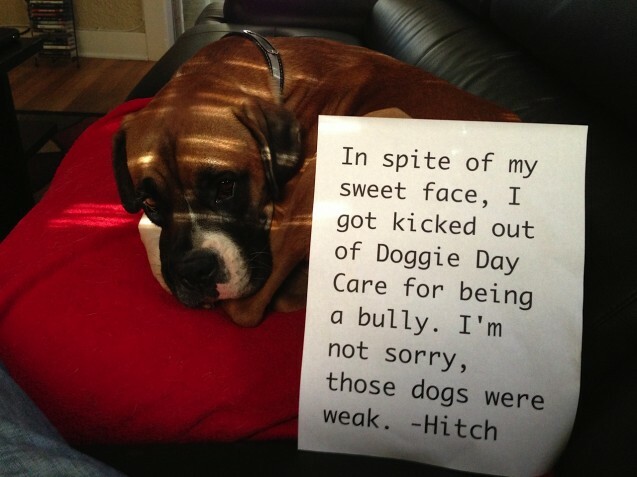 My boxer, Baxter, was also kicked out of doggie day care. He wasn’t aggressive, he just didn’t understand that the ball was not exlusively his. Boxers are often misunderstood at doogie daycare sort of places. Their play often sounds like “attack” to the people that work their. Boxers are rough players to the extreme. He was probably trying to be himself and just needed another boxer to understand. My boxer mix did great at the dog park with another big girl that she could bump chests with and run around like a nut. She was just very exuberant and needed other pups who could keep up with her. oh my God. they are DOGS! some of you need an enema. I have a boxer mix (mutt really), people don’t understand that they are just loud, and rough. Not the hurt you rough. But the push all the furniture back so we can have a WWF smack down in the middle of the living room kinda way. You love him, he loves you, enough said! I had a wonderful Frenchie and we shared a great bond but regardless of what I tried he did not play well with others. He was a people doggie. I have a 7 month 70lb Boxer now and I have him in doggie daycare and he goes everywhere I go. He’s perfect also and loves every dog, person and thing but can get rough sometimes. He has several other Boxer buddies to play with at daycare- Mabe look for a daycare that has some Boxers. He’s as sweet as can be with people. We rescued him about four months ago and he’s just got some anxiety issues that we’re working on. We’ll get him there, it just takes time. There’s no telling what his first year was like. I completely agree with Brenda. My late brindle rescue, Miss Lily got kicked out of her fancy Dallas doggie daycare for “boxing” with other dogs. They weren’t used to boxer play. I would like to think she’d wear that sign proudly. Miss her tons!